Was born in 1857, and educated at Eton. He is an ardent and enthusiastic sportsman, and has travelled in all parts of the world. For many months he travelled with the Countess through the Canadian Rockies, big-game shooting, and he also carried out an expedition to the Arctic Regions. 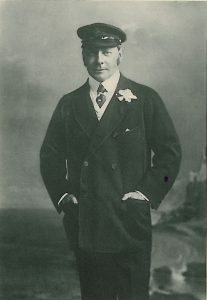 Lord Lonsdale commenced yachting at a very early age with his father on the Hornet, and afterwards with the late General Owen Williams. During the time Lord Lonsdale had the hounds he did very little yachting, but later took again to racing with Lord Dunraven and the Valkyrie, but raced his own yacht Dierdré, which he purchased from the latter. She was built in 1893 from designs by Mr. G. L. Watson, and, though Dragon III. was her great and very successful rival, she won in one season twenty-one prizes in thirty-five starts, and the next season thirty-four prizes in forty-five starts. Lord Lonsdale next owned the Verena, better known as Shamrock, 316-ton schooner. It was on board this fine ship that her owner enter­tained the German Emperor during his visit to Cowes in the Squadron Week of 1894. Lord Lonsdale is hereditary Admiral of the Coasts of Cumberland and Westmoreland, and Lord Warden of the West Marches. In 1903 he visited every port in the Yellow Sea and Gulf of Pechili, Formosa, Port Arthur, Chi­mulpo, and Japan, just prior to the war. He also visited the South Pacific Islands, Fiji, etc. Clubs: Royal Yacht Squadron, Royal Victoria. Residences: Lowther Castle, Westmoreland ; Whitehaven Castle, Cumberland ; Barley Thorpe, Oakham ; and 14, Carlton House Terrace, S.W.